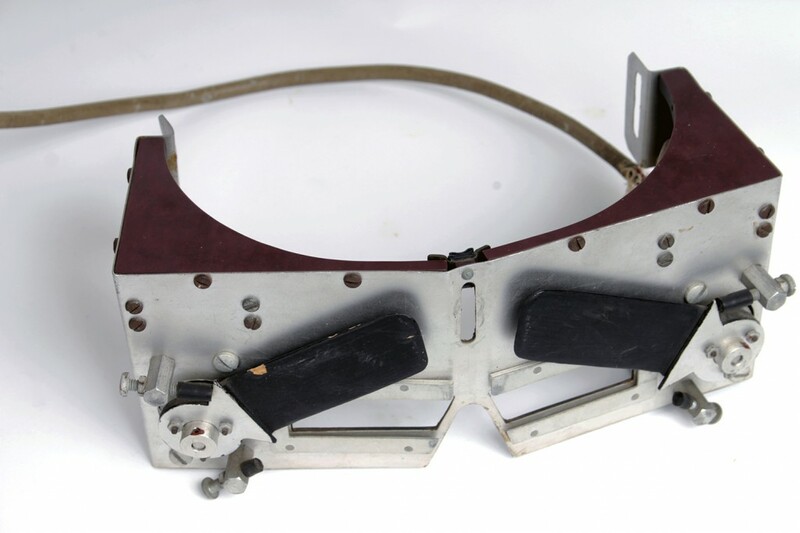 These goggles are designed for use with a visual occlusion apparatus. Shades drop to cover one or both eyes. It was likely used in John Senders' research on visual sampling. The Engineering Psychology Collection consists of artefacts representing human factors research at the University of Toronto. Human factors research is an engineering discipline that studies the interface between machines and human operators. It intersects with psychology in areas such as the study of attention and reaction time. The collection was acquired in 2012 from the Ergonomics in Teleoperation and Control Laboratory (ETC-Lab), run by Dr. Paul Milgram at the Department of Mechanical and Industrial Engineering. The collection consists mainly of precision electrical instruments and apparatus. Many of the artefacts in the collection relate to the research of Dr. John Senders. These artefacts date mainly from the early 1970s into the 1990s. Contact: Erich Weidenhammer (erich.weidenhamer@utoronto.ca), Curator, University of Toronto Scientific Instruments Collection.